What are the other modes through which Akshaya Patra raises funds? Offline fundraising, online fundraising, CSR and through fundraising events. Does Akshaya Patra have permission from the State and/or Central Government for collecting donations for the mid-day meal programme? In the year 2003, we applied to the National Committee for Promotion of Social and Economic Welfare, Department of Revenue, Ministry of Finance, Government of India, explaining our mid-day meal programme. This committee is headed by the former Chief Justice of India and several other prominent citizens from all over the country. On examining our programme, Akshaya Patra was recommended as an eligible project by this National Committee to raise donations up to Rs.22 crores and grant 100% tax benefits to the donors. This committee reviewed our programme in the year 2006, and further extended the benefits of 100% tax exemption to the donors for another three years. In the year 2009, Akshaya Patra programme was reviewed and the tax exemption benefit to the donors was renewed for another three years. The Guidelines, in Annexure IX Para 7: "The state government shall be fully responsible in implementing the program through NGOs support either for a cooked meal or pre cooked food variant in eligible schools. To this extent the State Government or the NGO concerned, may mobilize resources for conversion of food grains in to a cooked meal." The mid-day meal programme is conducted in the Private-Public Partnership model within the guidelines of the Government. Civic society participation in nation building is one of the important aspects of the Government's mid-day meal programme. Many eminent citizens of the country have given donations and supported us in this programme. There are many other NGOs providing mid-day meals in the country like Nandi Foundation (Hyderabad), Adamya Chetana (Bangalore) and ISKCON Food for Life Foundation (Mumbai) and all of them also raise donations from the public to conduct the Mid-day Meal Program. All these NGOs also have websites and solicit donations online and offline for their mid-day meal programs. Further, in a mature and civilised society, the civic society's impetus to contribute and participate in the development of the weaker sections of the society should be encouraged. This is a universal fact and Akshaya Patra has been encouraging the public, corporations and foundations to support this programme for the benefit of the children. Recognising this, the Institute of Chartered Accountants of India conferred the Gold Shield Award for Excellence in Financial Reporting to The Akshaya Patra Foundation for 5 consecutive financial years beginning with 2008-2009 till 2012-13. The Government spends Rs. 60,000 per school to set up the kitchen infrastructure for providing meals. In the case of schools where Akshaya Patra is providing the meals, the Government does not have to set up the kitchen and hence this amount is saved.In Karnataka, Akshaya Patra is providing meals in more than 2,627 schools, which means a saving of over (Rs. 60,000 per school x 2,627 schools = ) Rs. 157 million (15.7 crores) to the Government. Does Akshaya Patra have permission of the Government to receive donations from foreign countries? For receiving donations from foreign countries, Akshaya Patra has taken the permission from Ministry of Home Affairs, Government of India, under Foreign Contributions (Regulations) Act and the statements of all donations received are being reported to the Home Ministry year after year. How much does it cost to set up a centralized kitchen to cook for about 1 lakh meals? - The cost of setting up a kitchen for North Indian menu is about Rs.9 crores. What is the contribution from the Government towards the cost of setting up centralized kitchens? There is no contribution from the Government, either Central or State, towards the cost of setting up centralized kitchens. The Akshaya Patra Foundation raises donations from individuals, institutions, foundations and corporations to meet these expenses. Where can I see the cost per meal break-up? For more information visit How is your money spent? Is there a need for Akshaya Patra to raise donations in addition to the government subsidies? 1. To set up large centralized kitchens. 2. To maintain the large kitchen infrastructure. How does Akshaya Patra justify the cost effectiveness of its operations? 1. Akshaya Patra provides a sumptuous three or more item menu. This meal meets the nutritional requirements of children, complying with the Government norms. 3. We strive to meet the Government norms in terms of consumption of dal, vegetables and oil. Curds are also served from South Indian kitchens. 4. In addition, an item like sambar can be made with lesser dhal and vegetables as well to reduce the cost, but Akshaya Patra has always strived to provide a certain standard meal for the benefit of the children. 5. Our model kitchens enable us to deliver. Cost is incurred for set up and maintenance of same. What does Akshaya Patra do with the unused government rice? We return unused rice or draw less rice for the next month. This practice is followed in all our Akshaya Patra kitchens. Secondly we are making attempts how to increase the intake of grains by children as the government norms is to feed 100 grams per meal. Our experience has been that the children in Bangalore, Hubli and Bellary schools do not consume 100 grams despite a three item menu including curds. We have also informed about our experience of the actual consumption of grains in different parts of the country to the Ministry of Human Resource Development, Government of India, New Delhi. Were there some allegations against Akshaya Patra program in the Legislative Assembly of the Government of Karnataka? What was the outcome of this? Some persons with vested interests had misinformed a few MLAs (Members of the Legislative Assembly) due to which certain questions were raised and allegations made in the Legislative Assembly of the Government of Karnataka in April 2007. Subsequently to clarify all misinformation and clean up the image of Akshaya Patra, we requested the Education Department of the Government Karnataka to conduct an investigation on all questions and allegations made against Akshaya Patra. A three-member committee consisting of Gazette Superintendent, Assistant Director and Accounts Superintendent was set up to conduct the investigation. "Akshaya Patra is conducting the mid-day meal program since 2001-02 in association with the government. No malpractices of discrepancies have been found in the execution of the program. There have been no instances of any adverse effects of the meals on the children. No instances of misappropriation or misuse of funds and grains provided by the government were found during the investigation. When all these information is scrutinized, I find that the allegations made by Sri Venkataswamy are far from truth." Having fallen victims of base human frailties like envy and jealousy of the stellar growth and the good name that Akshaya Patra has earned since inception in the year 2000, certain resentful agents are on a maligning campaign of the Foundation and its leadership. These agents are trying to distort the facts and misrepresent the intent of the program with a spiteful objective to disturb the faith of the donors and supporters of this program. Hence we have tried to address these issues in the form of the FAQs given above. 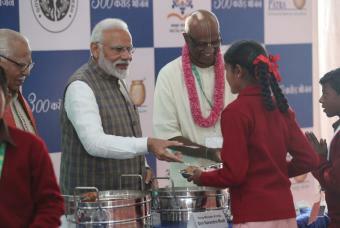 What is unique about the Akshaya Patra mid-day meal program? 3. Transparent, professionally managed, and run by a Board of Trustees, with the support of committed professionals and volunteers. Does Akshaya Patra receive government funding? Yes, Akshaya Patra receives a grains and cash subsidy. Is Akshaya Patra a registered charity in India? What is the Akshaya Patra's PAN Number?